What, pray tell, was the cause of action here? 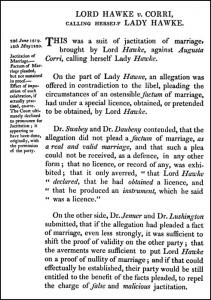 What exactly was Lord Hawke suing for? It was a suit for jactitation. And, no, actually, The Legal Genealogist had never heard of it before either. 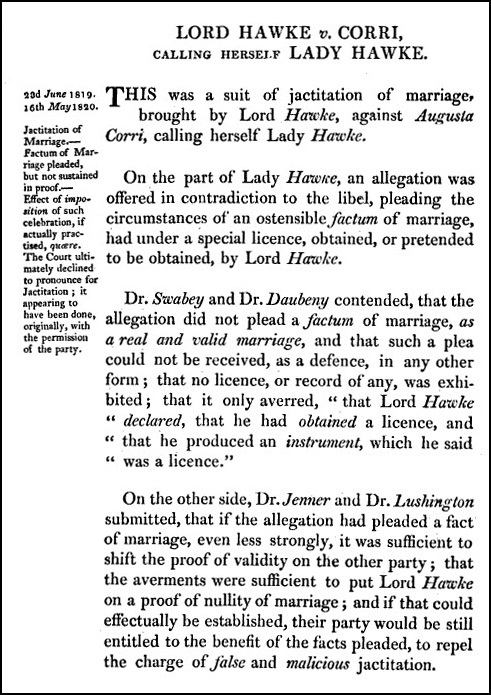 And, it turned out, that Lord Hawke really wasn’t married to Augusta Corri. But he still lost the case. Turns out, you see, that her version was he’d swindled her into believing they were married by taking advantage of her maidenly naivete and having a ceremony performed by a man he told her was a minister of the Church of England. And his version in response to that was that she was no maiden but a woman with a living husband who’d willingly become his mistress and okay, so he’d allowed her to say she was his wife, but only while they were cohabiting. We learned something, you and I, here today. And, we might imagine, maybe Lord Hawke did too. You have it exactly right, Mary Ann! Or the “having made thy bed, lie in it!” judgment. Thanks, Donna. I love coming across examples like this!